Cyber security skills are essential to any organisation committed to addressing the increasing risk from cyber attack. Experienced and qualified information security professionals are much in demand and there is a global shortage of cyber security skills. ISACA's recently released 2015 Global Cybersecurity Status Report found that 86% of respondents believe there is a shortage of cyber security professionals, and 92% expect it to be difficult to find skilled personnel in 2015. In this highly competitive job market, candidates need professional cyber security qualifications that are awarded by industry-recognised exam bodies. Our training programme offers a structured learning path from Foundation to Advanced level and is focused on building the management skills required for effective cyber security (ISO27001), business continuity (ISO22301), data privacy compliance and IT governance. All courses include examinations developed by IBITGQ, EXIN or APMG, and designed to enhance careers with industry-standard certifications and peer recognition. 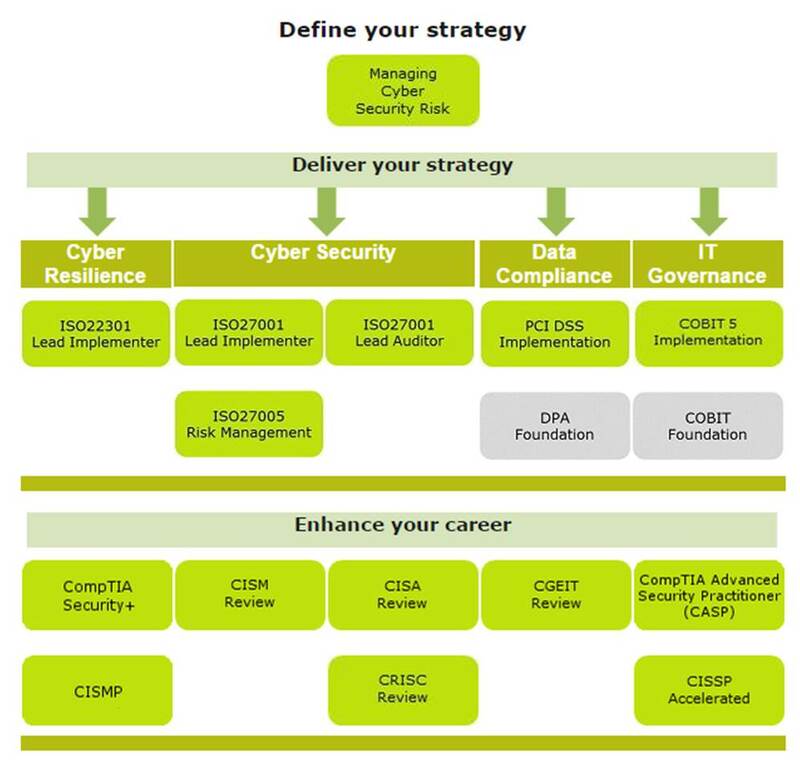 IT Governance professional certification courses have been designed to provide exam preparation and complete ‘course + exam’ packages that deliver the essential ISACA and (ISC)2 certifications such as CISM and CISSP, together with CompTIA Security+, CASP and CISMP qualifications. ISO/IEC 27001 forms the backbone of every intelligent cyber security risk management strategy. Gaining knowledge and experience in implementing and auditing an ISO 27001 compliant information security management system (ISMS) will deliver cyber security objectives and enhance your information security career. The ISO 27001 Certified ISMS Lead Implementer Masterclass provides the skills required to plan and implement an effective ISO 27001 compliance project and is part of the wider ISO 27001 Learning Pathway. PAS 555 clearly defines the required outcomes of an effective cyber security strategy. The advanced level Cyber Security Risk Management Course explores the outcomes specified in PAS 555 and how to implement standards and frameworks that are appropriate to effective cyber security risk management in your organisation. ISO/IEC 22301 defines the requirements of a business continuity management system (BCMS). Planning to ensure that your business can continue to operate, in the event of a cyber security incident is a key part of a complete cyber security strategy. The ISO 22301 Certified BCMS Lead Implementer course will enable you to plan and implement an ISO22301-compliant BCMS and is part of the wider ISO 22301 Learning Pathway. ISO/IEC 20000, the IT service management standard, can be integrated into a broader cyber security strategy. The ISO 20000 Practitioner certificate provides an overview of ISO 20000 and how it applies to service management. This course forms part of our wider Service Management Learning Pathway. The PCI DSS (Payment Card Industry Data Security Standard) aims to increase payment card data security. For organisations that store, transmit, or process card-holder data, PCI DSS compliance forms a key part of an effective cyber security strategy. PCI DSS Implementation and Maintenance training will enable you to develop the skills to plan and implement a cost-effective route to compliance. All UK organisations must comply with the Data Protection Act (DPA). With the increasing risk of hacking, data breaches and data loss, the Information Commissioner’s Office (ICO) has been levying significant fines and other punitive measures against organisations that fail in their duties. The DPA Foundation Course will provide you with a clear overview of the DPA and its application. IT Governance offers an unrivalled portfolio of training courses leading to industry-standard professional certifications. ISACA certifications are among the most highly regarded must-have qualifications for building a senior management career in information security, IT audit and IT governance. The IT Governance ISACA Examination Preparation Programme is designed to provide an intensive and complete preparation to help delegates pass the CISA, CISM, CGEIT or CRISC exams. CISSP certification, awarded by (ISC)2, is a globally recognised standard of achievement that confirms an individual's knowledge in the field of information security. CISSPs are information assurance professionals who define the architecture, design, management and/or controls that assure the security of business environments. The CISSP Accelerated Training Programme is designed to provide an intensive and complete preparation to ensure that delegates pass the long (up to six hours) and difficult (ISC)2 CISSP examination. The CISMP classroom training course provides a comprehensive foundation-level education in the key topics of information security management that include risk management, technical controls, legal frameworks, physical security, standards and business continuity. The five-day CompTIA Advanced Security Practitioner (CASP) training course is a classroom-based session designed to deliver the practical knowledge required to understand, design and implement secure information security solutions for complex enterprise organisations. Train with the UK’s leading cyber security consultancy. Contact us for further information by email or on 0845 070 1750.